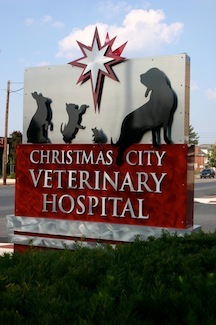 Thank you for your interest in Christmas City Veterinary Hospital. We have built this hospital with the goal of providing excellent veterinary care and service to our patients and their families in a welcoming neighborhood environment. After extensive renovations under the skilled guidance of my contractor and husband, Tony, we have transformed the 20th century former PNC bank building into a beautiful, state-of-the-art 21st century veterinary hospital destination. The hospital has been designed with every attention to detail. I have drawn from my nearly two decades of experience as a veterinarian, as well as sought the advice of my highly-trained and seasoned staff, my architect, and my veterinary practice consultant. This ensures that we have created a care center not just for today, but one that can grow and change with us as we mature. I always want you to feel as though you have arrived at a first-rate, clean veterinary practice where you can trust that your pet will be safe, well cared for, and comfortable. We have reused some of the original building materials including the glass walls in the surgery suite (formerly the foyer walls of the bank). We recycled communication wires as well as several tons of scrap metal from the various safes, safe deposit boxes, and filing cabinetry. We even repurposed the original bank vault for my office! You can’t miss the vault door in our first exam room. Please ask for a tour when you arrive. And, yes, you can come visit me in my vault/office; just whatever you do, don’t lock the door! I look forward to meeting you and caring for your pet!